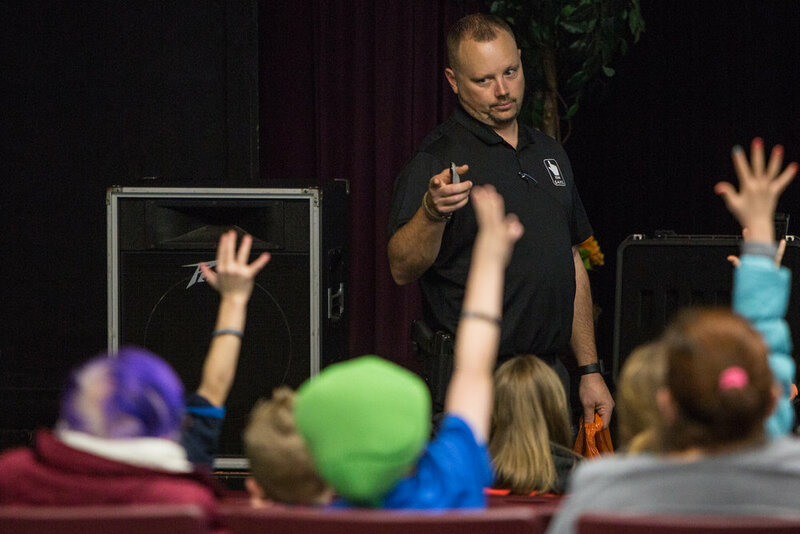 NRA certified firearms instructor Derek LeBlanc discusses proper handling of a lever-action rifle at a Kids S.A.F.E. gun safety course in Springfield, Ore., on Jan. 22, 2017. "I want everyone to be armed, but I also don't want any family to experience a tragedy." LeBlanc observes a child handling a Glock handgun during a Kids S.A.F.E. course in Springfield, Ore., on Jan. 22, 2017, looking to ensure she keeps her finger off of the trigger, and the muzzle pointed in a direction away from anyone who would be harmed if the gun were to fire. "With guns in the house comes a lot of responsibility," said LeBlanc. "We've got to keep the kiddos safe. The only acceptable goal is zero firearm accidents." LeBlanc asks one of the children attending a Kids S.A.F.E. presentation to provide one of the steps to follow if they were to ever find a gun without an adult around. As a staunch supporter of the right to own and carry firearms provided by the second amendment, LeBlanc hopes to motivate others to carry guns more often, but also recognizes the potential risks created when more people carry guns more often. "I want everyone to be armed, but I also don't want any family to experience a tragedy," said LeBlanc. Derek LeBlanc listens to advice from his volunteer staff and girlfriend Jen Ebert after completing his first Kids S.A.F.E. presentation inside a public school on Feb. 3, 2017, in the Elmira High School Auditorium. "Gun education in every school is the goal," said LeBlanc. LeBlanc carries a concealed firearm on his person most of the time. 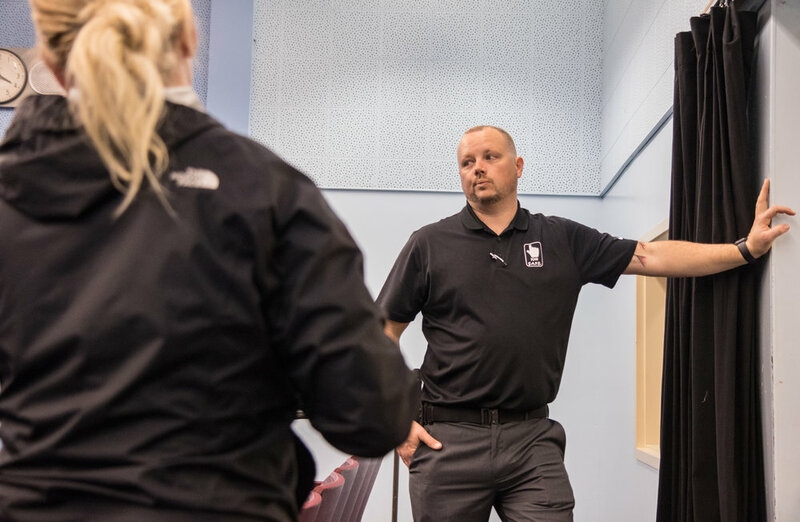 His passion for self-defense originated after an altercation in his home, which ended when a girlfriend theatened an intruder with a shotgun until the authorities could arrive. "I plan my vacations around where I can carry my gun now," he says. 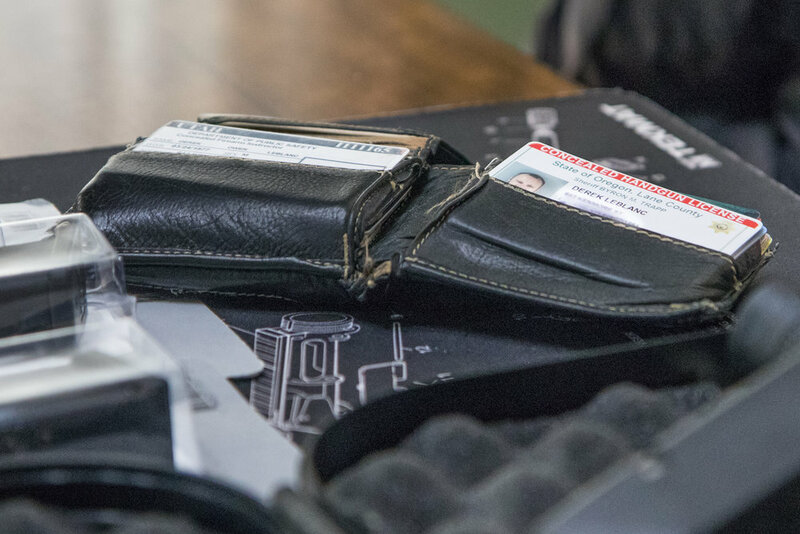 Though he hopes to never have to use his gun in any kind of violent encounter moving forward, he believes in his right to protect himself, and says that "seeing a barrel or hearing a gun's slide is often all it takes." 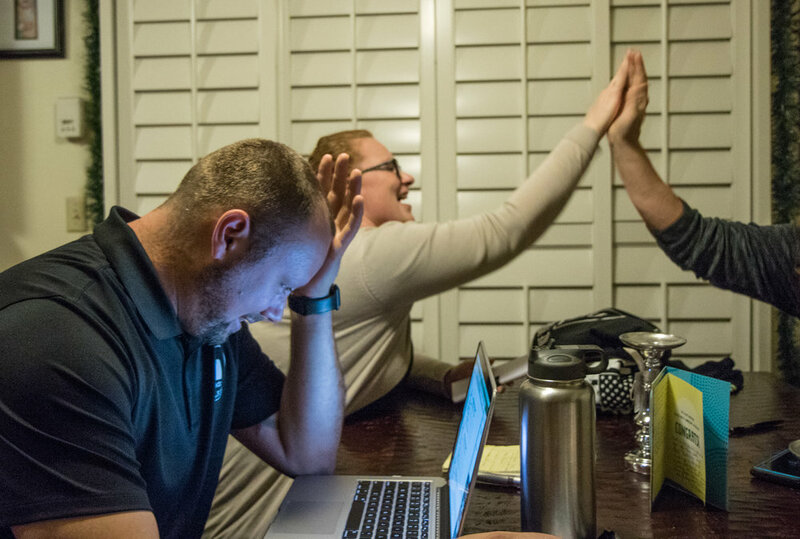 Derek LeBlanc reacts after volunteers and Lethal Lovebirds class participants Krystal Ashley and Diane Slocum reveal they have already sold multiple tickets for his raffle for an AR-15 modern sporting rifle, moments after making a bet to sell the most in a week, during a staff meeting on Feb. 2, 2017, prior to the Eugene Boat & Sportsman show. "These women are my rocks," said LeBlanc. "They keep me in this business when things get really tough and I want to quit. " Karen Wussting speaks with Derek LeBlanc about techniques for dealing with a misfiring gun during a women's self defense course at the Albany Pistol & Rifle Club in Albany, Ore., on Feb. 11, 2017. "My goal is to get as many of these women as possible to feel comfortable carrying a firearm in their daily lives. It takes confidence, and confidence only comes with time and practice," said LeBlanc. Karen Wussting fires down range during one of LeBlanc's women's self-defense classes at the Albany Rifle and Pistol Club on Feb. 11, 2017. Though she has held her concealed carry permit in Oregon for multiple years, she has never actively carried firearms. "I'm hoping to build my confidence with the gun so that I will feel more comfortable keeping it on me more often," Wussting said. 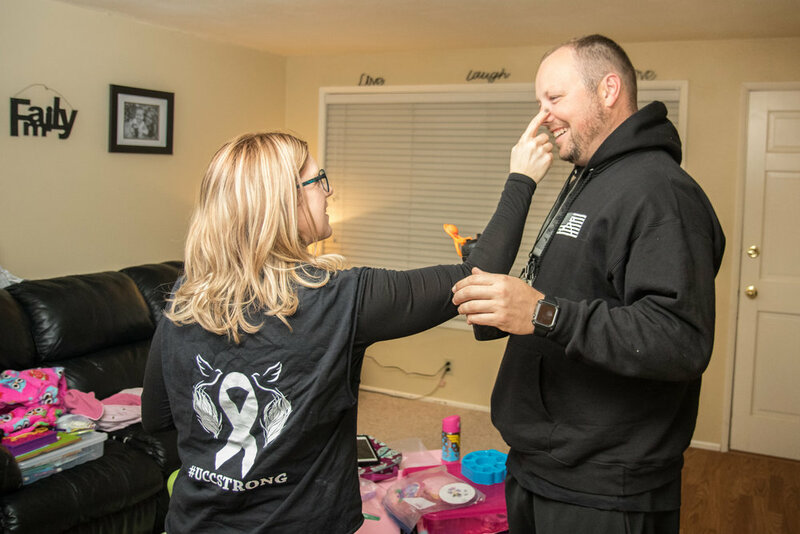 LeBlanc's girlfriend Jen Ebert laughs and pokes at a zit on his nose as they wait for Ebert's daughter Payton to get ready before leaving for an evening workout at Eugene Crossfit. "Guns were never that important to me before I met Derek," Ebert said. "But now I understand how important teaching safe practices really is. I want my daughter to be safe as she can be, even when I'm not around."